Amazingly Simple and Affordable Small Group Video Conferencing Has Arrived. Combines HD 1080p 30fps video with high-quality full-duplex speakerphone clarity for business-grade video conferencing. Now groups can collaborate over video from anywhere – no more competing for those overbooked conference room systems or huddling around a single PC just to have a video meeting. 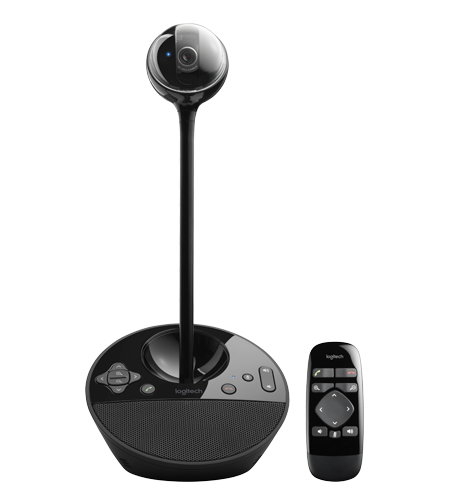 Combines HD 1080p 30fps video with high-quality full-duplex speakerphone clarity for professional video conferencing. Now groups can collaborate over video from conference rooms, offices and collaboration spaces – no more competing for those overbooked conference room systems or huddling around a single PC just to have a video meeting. UVC H.264 onboard technology helps ensure quick plug-and-play functionality on both PCs and Macs – no software to install. Works on virtually any desktop video conferencing and UC application – including Adobe Connect, Avaya, Cisco WebEx and other Cisco Video Conferencing applications, Citrix Go to Meeting, LifeSize Connections, FaceTime, Google Hangouts and Video Chat, Microsoft Lync and Office365, Vidyo, Skype. No proprietary and expensive systems to set up. Quickly control your meetings with the remote – answer/end calls, set volume up/down, pan, tilt, zoom and mute. A 78-degree field of view and 180-degree remote-controlled video pan, tilt, zoom ensures each member of the small group is seen. The built-in, full duplex speakerphone and noise-cancelling microphone allow all meeting members to hear and be heard clearly up to 8 feet away from the base. Enjoy razor-sharp images from a glass lens designed with the help of an industry leader, Carl Zeiss®. Allows detailed documents, whiteboards, or visuals to be shared close up during calls. The camera height extender and 8-foot USB cable allow users to adjust camera height and distance for the most flattering video angles so they can make the best impression during meetings. Omni-directional sound and echo cancellation audio makes it seem like conversations are happening in the same room. The ConferenceCam is certified for Microsoft® Lync™ and Skype™. Because almost all UC and web-conferencing applications are UVC compatible, Logitech video and audio products work across all applications without needing additional software drivers. Please Click LIKE to support this site. Thank You. Combine shipping for buyer purchase more than one item,save your shipping charges, but it depend on your delivery location area. Combine shipping charges varies according to item's weight and size. We courier to every state of Malaysia :- Johor, Kedah, Kelantan, Melaka, Negeri Sembilan, Pahang, Perak, Perlis, Pulau Pinang, Selangor, Kuala Lumpur, Terengganu, Sabah & Sarawak. Other countries please contact us for more information. Semua produk kami datang dengan pembungkusan & aksesori asal (melainkan dinyatakan). Harga tertakluk kepada perubahan tanpa sebarang notis. Membeli lebih dari 1 barang,anda boleh menggabungkan 1 kos penghantaran. Penghantaran produk kesemua negeri di Malaysia iaitu Johor, Kedah, Kelantan, Melaka, Negeri Sembilan, Pahang, Perlis, Pulau Pinang, Selangor, Kuala Lumpur, Terengganu, Sabah & Sarawak.